In this 10th and nearly final article pulled from Electric Cars: What Early Adopters & First Followers Want — a new report from CleanTechnica, EV Obsession, and GAS2 — we get to an exciting topic — EV Revolution!! I’ve mentioned “EV revolution” a few times already in this report. What am I talking about? By “EV revolution,” I’m referring to EVs taking over the personal transportation market in a relatively short period of time, something which I’m convinced will happen due to the significant benefits of electric cars (eight of them, by my count). However, when that will really start to happen is very debatable, even among those who are convinced it is on the way. So, I posed a handful of questions to the respondents to crowdsource opinions on this matter. 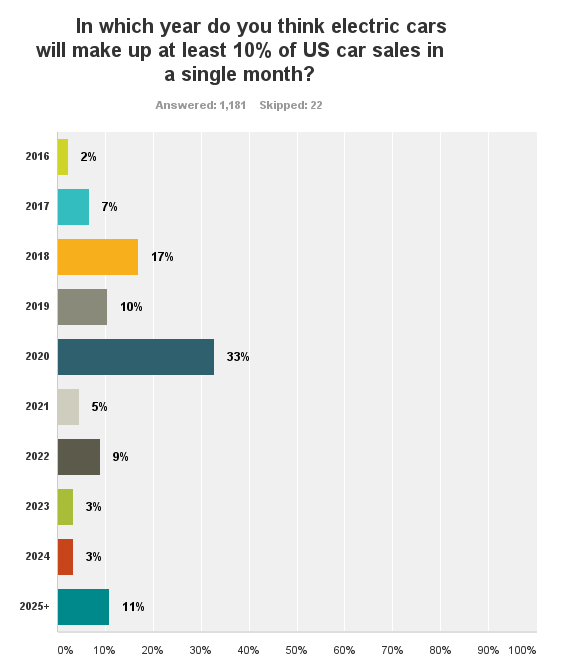 The first such question on this matter was, “In which year do you think electric cars will make up at least 10% of US car sales in a single month?” 33% of EV drivers and 33% of non-EV drivers responded 2020. In second place, 13% of EV drivers and 17% of non-EV drivers chose 2018. In third place, 17% of EV drivers and 11% of non-EV drivers chose 2025+. In addition, significant percentages chose 2022 (11% and 9%), 2019 (9% and 11%), and 2017 (4% and 7%). In other words, responses were all over the place, but 83% of EV drivers and 89% of non-EV drivers see this happening within the next decade. 71% of EV drivers and 63% of non-EV drivers chose 2025+. Only 8% of EV drivers and 11% of non-EV drivers see this happening by 2020. 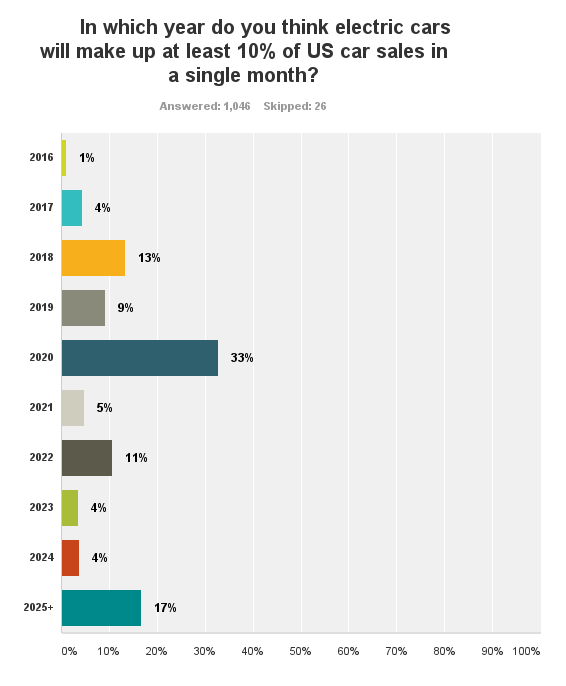 In other words, while these EV enthusiasts see strong electric car sales growth coming in the next few years, they think we are still at least a decade away from electric cars accounting for the majority of the new car market. 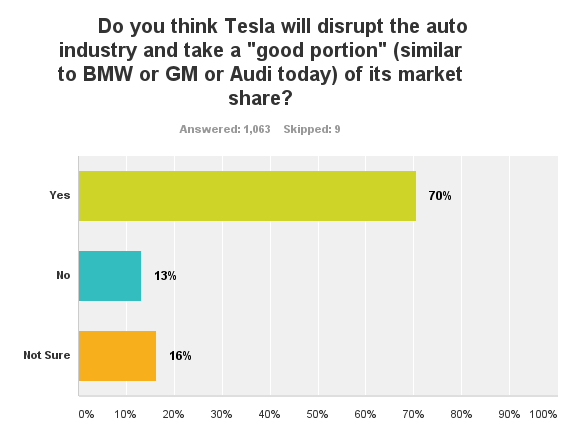 With Tesla Motors being the clear leader in the EV market from most angles, I also wanted to better understand how respondents felt about the company and how disruptive (economically speaking) they thought Tesla would be. The responses shocked me, even knowing that Tesla was a very popular company. 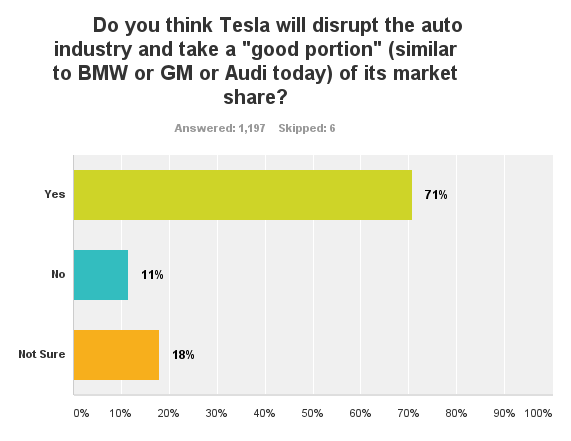 70% of EV drivers and 71% of non-EV drivers think Tesla will disrupt the auto industry, 16% and 18% are not sure, respectively, and 13% and 11% don’t think Tesla will disrupt the industry. On the whole, that’s a strong expectation that Tesla will really shake things up in one of the largest industries in the world. Competitive advantages Tesla currently has over conventional automakers include the Supercharger network, lower battery prices, the under-construction Tesla Gigafactory (which will further reduce battery prices), a reputation for high-performance and hi-tech cars, frequent over-the-air software updates to fix or improve cars, a sales and service-center system that trumps dealerships from the consumer perspective, and an undeniable “cool” factor. There’s still a lot of room for other EV pioneers like Nissan, GM, Mitsubishi, BMW, and Volkswagen to succeed in this realm, but many responses to this survey seem to indicate that the best way to do so is through association and partnership with Tesla. Specifically, partnering on the Supercharger network and perhaps future battery production plans could be very helpful to these other automakers. And simply being “friends with” the “cool kid on the block” could open up more consumers to their brands. These are big decisions for the heads of large auto companies to consider, but if I were in their shoes, I believe I would be working feverishly to walk alongside Tesla and partner on critical pieces of the EV lifestyle — particularly, Supercharging capability and growth. No matter what EV consumers buy, though, one thing is clear: they love driving electric. 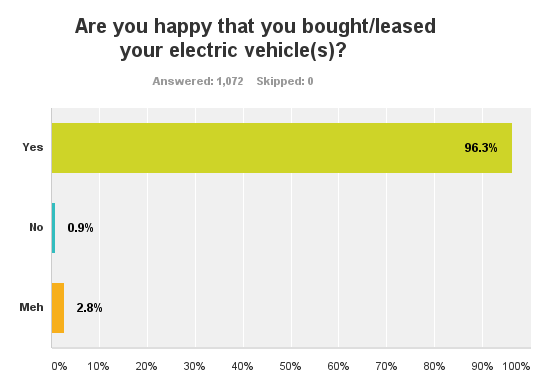 We asked the EV drivers, “Are you happy that you bought/leased your electric vehicle(s)?” 96% responded “Yes,” only 3% responded “Meh,” and only 1% responded “No.” See if you can find any other consumers so happy with their vehicles. Also, just before this report was released, it was revealed in the latest Consumer Reports Annual Auto Survey that the three cars topping the list for owner satisfaction were electric cars — #1 Tesla Model S, #2 Chevy Volt, #3 Nissan LEAF. In other words, the owners of these electric cars are happier with their cars, on average, than the owners of all the gasoline and diesel models on the market. That’s pretty telling. And to reiterate a point made earlier, friends and family who drove their EVs seemed to love them as well. 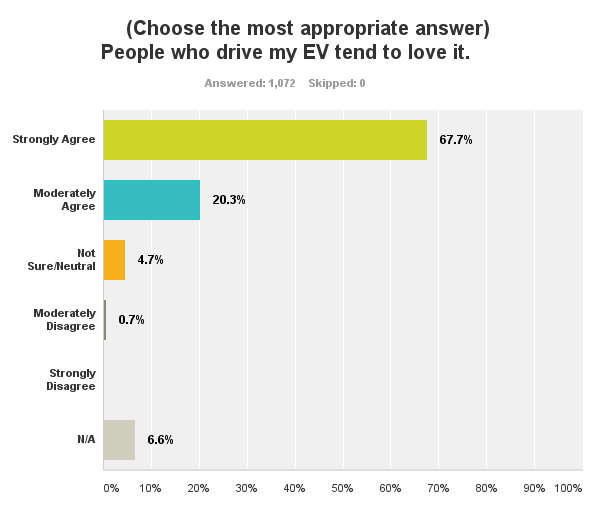 Under 1% disagreed with the statement, “People who drive my EV tend to love it,” and only moderately so.